When I began my walk this afternoon the temperature was 57. When I got home about an hour later it was 63. Things are looking up. Tomorrow is predicted to be at least as pleasant. 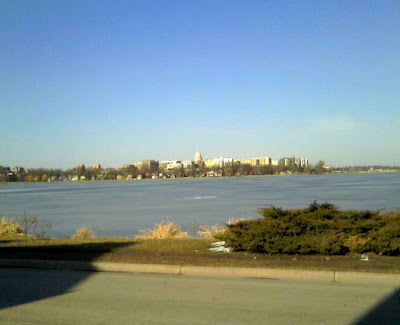 I walked around Monona Bay. The lake and the bay are still frozen but the ice fishermen have disappeared - they are wiser than I have sometimes credited them with being. If tomorrow is truly nice I'll hook up the hose and clean off the balcony. The cellphone picture is from the southwest side of Monona Bay. The building where I live is one of the two light brown towers on the horizon toward the left side of the picture. I make my home in the one furthest left. I never pictured you being at home in the furthest left in Madison. Perhaps I should have reversed the picture.